This blog post includes topics discussed from our weekly webinar. Watch the recording here. One of the best ways of growing an eCommerce business is to invest in digital marketing. If you want more customers, you will need to get your name out there in order to drive more traffic to your online store and generate sales. The question is: which digital marketing channels should you focus on to get more website traffic? 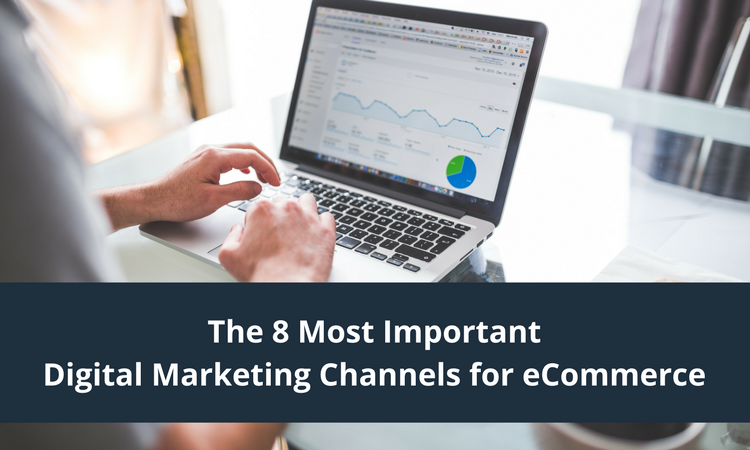 In this post, I want to share with you the 8 most important digital marketing channels. The organic digital marketing channel includes all website traffic that comes from search engines such as Google, Bing, Yahoo or DuckDuckGo.com. People will discover your website when searching a specific topic or product. If your online store is well optimized, search engines will position it among the top results of search pages. If you want more traffic, invest in search engine optimization (SEO). The email digital marketing channel includes all website traffic that comes from email messages. In order to drive traffic from email, you will need to grow your email list. The paid search digital marketing channel includes all website traffic that comes from paid ads on search engines. It may also be referred to as search engine marketing (SEM) or pay-per-click (PPC). Online store looking to drive traffic from search engines marketing should focus on launching their Google Shopping campaigns or Bing Product Ads since those types of ads produce among the best return on investment for eCommerce. The content marketing channel includes all website traffic that comes from your blog, videos and digital downloads such as buying guides. Content marketing can also be referred to as Inbound Marketing, a term used by Hubspot. Creating content that provides value (helpful) or entertainment can help eCommerce business drive traffic to their online stores since this content will be picked up by search engines or shared on social media. The social media digital marketing channel includes all website traffic that comes from social media networks such as Facebook, Instagram, Pinterest, Twitter, Snapchat and more. Traffic from social media can be free organic traffic or paid advertisements. Over the past couple of years, social networks have been making it difficult for eCommerce businesses to get noticed using free initiatives. They want you to pay to play. The affiliate digital marketing channel includes all website traffic that comes from affiliate partners in exchange for a commission on all completed orders. You can build relationship with cash back website such as eBates, coupon sites such as Retailmenot.com, deal sites like Slickdeals.net, bloggers and online influencers. The referrals digital marketing channel includes all website traffic that comes from literally everything else on the internet including apps. It can include websites where you may be running display ads, sponsored blog posts or digital newspapers. I usually include anything that’s not included in the other 7 channels both organic and paid. The direct channel includes all website traffic that comes direct to your website with no referring website. People usually either type your website url directly in their web browser or access their bookmarks. Direct traffic allows you to also measure some of your offline marketing efforts such as radio, tv or events. For example, when people see your ad on tv, they might use their smartphone to access your website directly. The one thing I always recommend when creating a digital marketing strategy is to define your objectives (goals) as well as establishing your performance metrics. That’s the only way you can monitor performance and be able to do more of what works.